Sometimes you eat the bear, sometimes the bear eats you -- and sometimes an eagle tries to eat your rabbit. Video captured by Zachary Hartje on San Juan Island in Washington shows an eagle swoop down and latch onto a rabbit that's in a fox's mouth. The fox was carried into the air, about 10 feet high and for about 50 feet, before it disengaged and dropped to the ground unharmed, Hartje said. The eagle flew away without the rabbit, but it's unclear whether the fox reclaimed its meal. "I was shocked and amazed," Hartje told ABC New York station WABC-TV. "I have never seen this happen before, and no one else who I talked to there, or on the island, has ever seen it happen before." 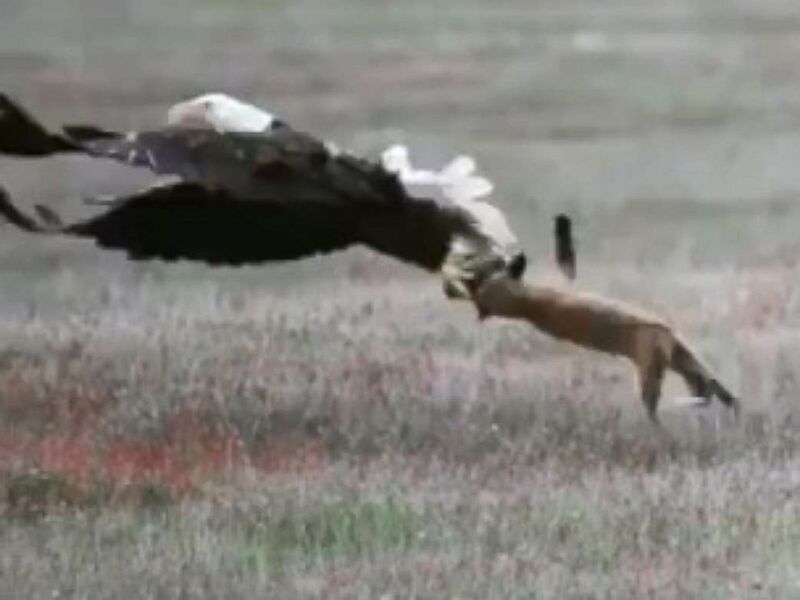 An eagle tried stealing a rabbit that had been caught by a fox.